After more than a decade of ads featuring the employees who make its cereal, Honey Bunches of Oats has launched creative chock-full of pop cultural and social media references. The campaign targets both mainstream and Hispanic audiences, and aims primarily to woo younger consumers, while also appealing to a broader age demographic. While television continues as a core component, the Post Foods brand is also experimenting with new platforms — including Snapchat’s Snap Ads Between Friends and TV Sync, a solution that syncs social media ads with TV programming. The new campaign, with the emphatic tagline “THIS. IS. EVERYTHING.”, is from Burns Group. That agency also created “Dedicated to Delicious,” the latest iteration of the long-running campaign epitomized by the TV spot in which Honey Bunches production worker Diana Hunter talks about leaving work smelling like cookies. The new “Everything” campaign aims to “celebrate the multiplicity” of Honey Bunches of Oats’ tastes and textures — its crispy flakes, crunchy granola oat clusters and touch of honey — and convey that a bowl of the cereal “is greater than the sum of its parts,” says Julie Hewitt, the brand’s integrated marketing communications manager. Use of popular references and memes are meant to encourage consumers “to play with and make the content their own,” she adds. The approach is a departure from typical family-themed cereal-category creative, as well as from the brand’s own previous ads, Hewitt notes. 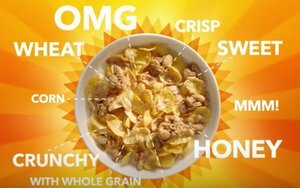 The general-market TV ad (below) starts off with the “Everything” tagline, and a sort of diagram showing all of the different ingredients and tastes in the cereal — with an “OMG” thrown in for good measure. That’s followed by a rapid-fire montage mixing nostalgic, current and “iconic” images, including Wonder Woman; what appears to be a circa-1980’s family photo; a clip of young people raising their arms in celebration; a shot of the Sistine Ceiling’s “Creation of Adam” image, altered to include a bowl of Honey Bunches…with images of honey, wheat and young adults enjoying the cereal interspersed along the way. A Spanish-language version is substantially the same, but includes images keyed to Hispanic culture, including clips from soccer matches and Hispanic family shots. Both ads have 15- and 30-second versions. They began running on Aug. 8. In addition, the brand has an integration deal with The CW’s “Jane the Virgin.” Starting Sept. 5 and in the weeks leading up to the Season 3 premiere on Oct. 17, the show’s main character and others will give recaps of Season 2 in branded video vignettes that also incorporate the cereal’s “Everything” messaging. The vignettes, which will be shown on CW’s Web site and social channels, will have the same style and tone as the Honey Bunches of Oats TV ad, which will air during the premiere. The Hispanic-market will air during telenovelas and lifestyle morning shows across Univision and Telemundo. Honey Bunches is sponsoring the finale of popular telenovela “Un Camino Hacia el Destino,” as well as the premiere for a new telenovela, “Amo Despertar Contigo” (both on Univision), with customized show recaps that are, again, in the same style and tone as the commercial ads. The brand is also launching a new microsite (in both English and Spanish) where consumers can go to insert their own images to create a personalized version of the “Everything” ad that can be shared with friends. Those who do so, starting Aug. 29, will be entered in a national sweepstakes for the chance to win $10,000. A digital ad campaign will drive consumers to the sweeps microsite. In a first Snapchat foray for Post Foods, Honey Bunches of Oats is using the Snap Ads Between Friends platform, just launched in June. The platform’s users will see the cereal’s video ads between strings of photos and videos as users share with their stories with their followers. One the campaign’s most innovative aspects will be using TV Sync to tie its ads on broadcast, cable and other TV platforms to its social efforts, in real time, with the objective of synergistic engagement-boosting. The software from Marin Social — a social advertising partner for “moment marketing” company TVTY — can automatically activate, in real time, social ads based on offline events including television ad flight schedules, program schedules, sporting events and weather changes. TV Sync allows advertisers to “amplify and extend their messages to Facebook, Instagram, and Twitter users, across multiple screens,” according to Marin’s site. Honey Bunches of Oats is also running its ads in cinemas across the country, both on their own and as part of “Hollywood Today” segments that run prior to movie previews, reports Hewitt. In addition, the brand is running promotional events at retailers and a mobile sampling tour that began in Detroit on Aug. 20 and will visit Boston, New York, Miami, Houston, L.A., San Francisco, Phoenix, Denver and Wal-Mart’s headquarters in Bentonville, Ark.